Terror and madness are not reserved for the darkest hours of the night. Evil can thrive in warmth and sunshine as easily as chill and gloom. This truth comes to light in Sanctum of Twilight, as two new investigators must combat the powerful Order of the Silver Twilight Lodge and expose their true nature. Yet among these trials of violence and death, there is still beauty. In the first of two new digital scenarios paired with this expansion, you are invited to participate in one of Arkham’s oldest and most prestigious events. The Silver Twilight Lodge is preparing to host its annual celebration, complete with a parade to dazzle the citizens of Arkham. But when a young debutante discovers a chilling secret at the heart of the festivities, it's up to you to stop whatever scheme has been put in place. You have the duration of the fair, approximately three to four hours, to uncover enough evidence to solve the mystery, but this is no easy task. 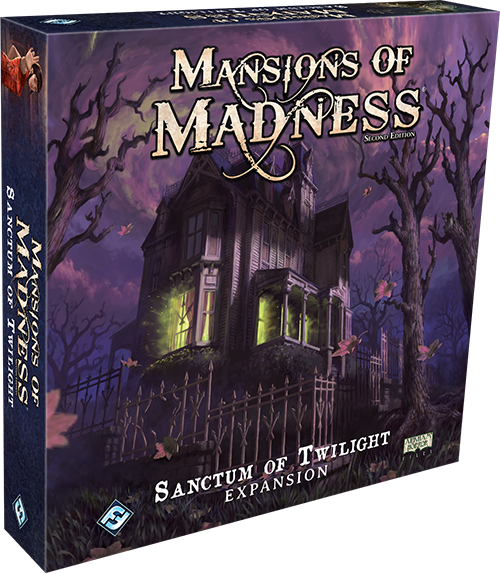 Today, we'll offer you a preview of the Twilight Diadem scenario from the Sanctum of Twilight expansion for Mansions of Madness, now available for pre-order at your local retailer or online through our website here! The annual Twilight Fair is a time-honored tradition in Arkham, hosted and funded by the Silver Twilight Lodge. This week, the fair will light up the streets of Arkham and on the last day of the event, one of Arkham’s beautiful debutantes will be crowned the Queen of Love and Beauty at the lavish Twilight Ball. This year, the coveted title has been awarded to Miss Mary Ann Chase, but the young woman senses that something is not right. She has come to you for help. “I know the Silver Twilight Lodge is up to something sinister, and you are the only one who can help me. The Twilight Fair is not all it seems.” Her tone is strong and insistent, but there is fear hidden beneath her sharp words. Miss Chase has good reason to be concerned. No one speaks of last year’s Queen or her mysterious disappearance, as if the influential members of the Order want to keep the incident hushed up. 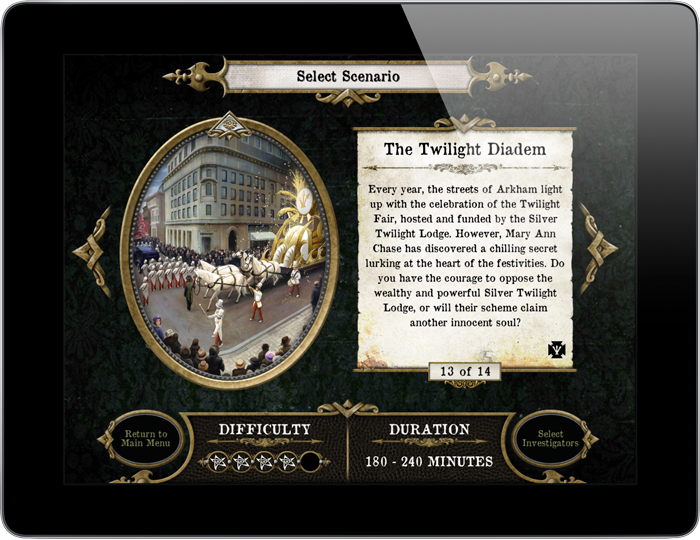 The Twilight Fair parade is scheduled for today, before the Twilight Ball, and your time is already running short to discover the truth behind the event. You agree to meet Mary Ann at the parade route before it starts, to investigate the Order while its members are distracted. Hopefully, there is still time to put an end to their plot before it is set in motion. Should you choose to attend the Twilight Fair, you will be witness to the stunning parade that the fair has become famous for. 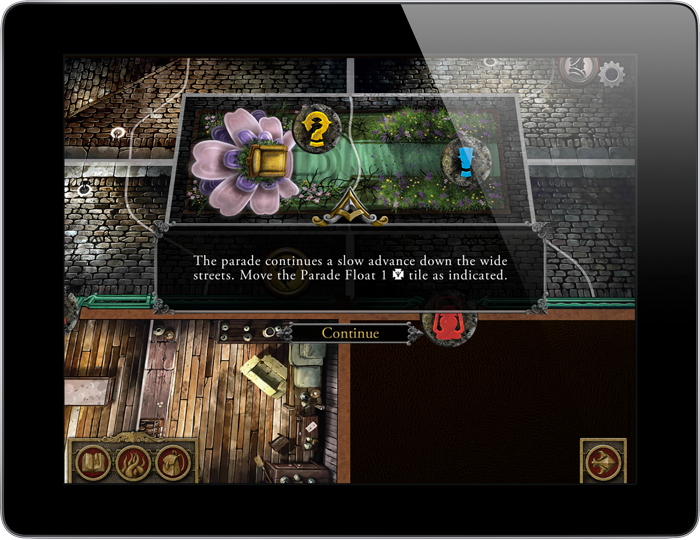 Sanctum of Twilight introduces a new map element in the form of parade floats that move throughout the scenario and overlap other map tiles. When one of these overlapping tiles is placed, all figures, tokens, and cards maintain their positions on the map, and while the overlapping tiles in this expansion cannot cover an entire space on the board, all people along the parade route must move aside to allow the floats to pass. If a figure or card would be covered by an overlapping tile, your investigators must decide as a group where to place them within the space so they won't be covered. As the parade floats by, the crowd of spectators grows. It may become harder to distinguish who is a friend, and who a foe. If you find yourself in a situation where you are hopelessly surrounded or outnumbered by monsters or members of the Order, Sanctum of Twilight provides you with a new magical implement in the form of the Binding spell. When you are in possession of a Binding spell, you may use an action to place a Restraint token in a space within range. 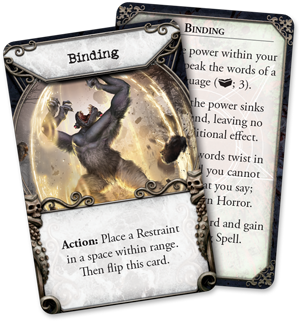 This powerful effect can keep a monster bound in place and prevent them from pursuing investigators who come too close—monsters in a space containing a Restraint token do not need to be evaded. Otherwise, the investigators may choose to use the magic all in a single moment, discarding the Restraint token to make the monster forfeit its movement for a turn. But you must use this power with caution: like other spells, each Binding spell is a double-sided card, and there is no telling what the cost of your magic will be. But if the price is high, that is only appropriate. Nothing in life is free. Do you have the courage to oppose the Silver Twilight Lodge, or will their scheme claim another innocent soul? Protect Mary Ann, learn the secrets of the Twilight Diadem, and bring an end to the plots of the Order of the Silver Twilight! Pre-order Sanctum of Twilight (MAD26) at your local retailer today or on the Fantasy Flight website here!